I hate traffic on a good day. I hate traffic on the M6 as everything seems to be ten times worse! And I hate traffic even more when you come to a standstill and it wakes your baby up and he screams! We got stuck a lot, we stopped to change and feed him and even that didn’t make him happier! Singing to him helped a little, as did playing with his two favourite toys, Sophie and Sam the Giraffes, but not for long. We then had a screaming baby again! 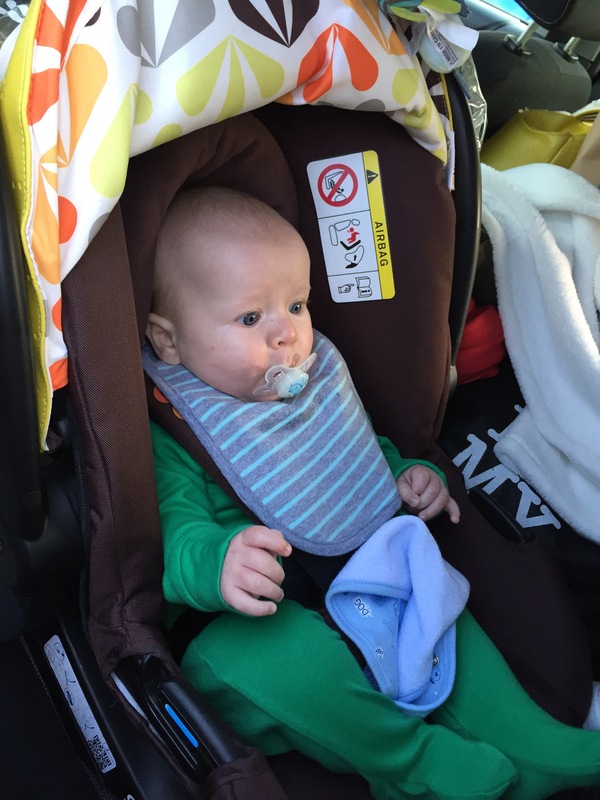 Alfie all ready in his car seat! The journey wasn’t much longer than it should’ve been, put seen as we took a detour and paid to go on the toll road, it wasn’t great. Could you leave very early in the morning or late at night to avoid some of the traffic. And one parent could sit in the back so they could amuse baby! ?